A collection of essays questioning the truth of American’s color-blind society from outside and inside communities of color. 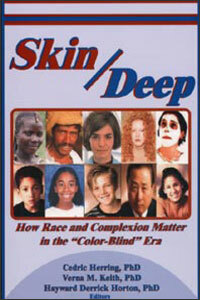 Shattering the myth of the color-blind society, the essays in Skin Deep examine skin tone stratification in America, which affects relations not only among different races and ethnic groups but also among members of individual ethnicities. Written by some of the nation’s leading thinkers on race and colorism, these essays ask whether skin tone differentiation is imposed upon communities of color from the outside or is an internally-driven process aided and abetted by community members themselves. They also question whether the stratification process is the same for African Americans, Hispanics, and Asian Americans. Skin Deep addresses such issues as the relationship between skin tone and self esteem, marital patterns, interracial relationships, socioeconomic attainment, and family racial identity and composition. The essays also grapple with emerging issues such as biracialism, color-blind racism, and 21st century notions of race.